This position resides in Cimarron, New Mexico within the Department of Cultural Affairs and is responsible for administering the Rural Bookmobile NE, a unit of the Rural Services program of the New Mexico State Library. This position is responsible for providing and ensuring quality, tailored, direct public library services for rural New Mexicans. This position will manage, evaluate, and promote the bookmobile program in a multi-county-region. In coordination with the Grants Program manager, it will be responsible for writing and setting guidelines and procedures as required for cost effective day -to-day operations. The manager and employees drive a 30+ foot bus (bookmobile) in which monthly schedules do require employees to travel overnight two weeks of any four week period on a rotating basis. Additionally, the manager operates and supervises the Cimarron Public Library, writing guidelines and procedures for the library. This position supervises two employees. A Bachelor’s Degree in any field of study from an accredited college or university and four (4) years of professional level experience operating within limited parameters and guidelines directly related to the purpose of the position defined by the agency at the time of recruitment. Any combination of education from an accredited college or university and/or direct experience in this occupation totaling eight (8) years may substitute for the required education and experience. A hiring agency will designate a portion of the required experience to include supervisory and/or specialized experience. Any required licensure, certification or registration shall be defined at the time of recruitment and will be in addition to the above requirements. Employment is subject to a pre-employment background investigation and is conditional pending results. Must possess and maintain a valid Driver’s License. Work is performed in a bookmobile and in a library office setting. 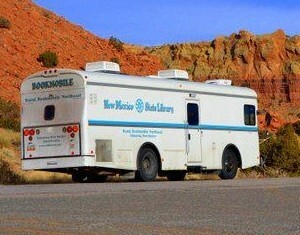 Bookmobile usually travels three out of four weeks per month. Required to sit for extended periods of time during mobile trips. Ability to lift and carry luggage, laptops and books and perform manual labor including lifting up to 40 lbs. Bending kneeling, and stretching is required to shelve books and to assist patrons with book selection. Ability to climb stairs to enter and exit the vehicle. Walking and standing for extended periods of time may be required. Requires driving bookmobile state vehicle on narrow New Mexico Roads, sometimes in adverse weather conditions, in emergencies and at night, but usually between the hours of 7:00AM and 7:00PM year round. Working Conditions for individual positions in this Manager Category Level will vary based on each agency’s utilization, essential functions, and the recruitment needs at the time a vacancy is posted. All requirements are subject to possible modification to reasonably accommodate individuals with disabilities. Lanelle Haught, (505) 476-9783 or Joy Poole, (505) 476-9712.